Via Sounding Circle, a story about Coca Cola using up valuable groundwater in various parts of India, and leaving a mess. Another dark spot is Mehdiganj (UP), where Coke built a bottling plant in 1995. Two tube wells draw hundreds of thousands of liters of ground water each day. Geologists have estimated that the company's voracious consumption may have lowered the groundwater level as much as 40 feet. The area's water crisis was further aggravated by the World Bank-funded Golden Quadrangle superhighway project, which shut off the water pipeline from a neighboring area. 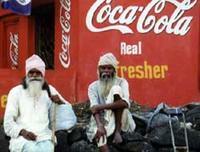 The Coke plant's proximity to the holy city of Benares has created further controversy. The factory's waste product was being disposed in a nearby canal that emptied into the holy Ganges River. Local Indians were enraged when they discovered that polluted waste was being dumped into the Ganges. Until recently, there was no clear way to test for Coke-related pollution in the vast Ganges. But in order to make way for the superhighway, construction workers dislodged Coke's waste disposal canal. The company then began disposing its waste products into neighboring fields and mango groves. At this point, the level of toxic waste became readily obvious to local residents. The Senate Sergeant at Arms and the Secret Service have concluded that ranking Republicans have been electronically burgling Democrat computer files. Republican staff members of the US Senate Judiciary Commitee infiltrated opposition computer files for a year, monitoring secret strategy memos and periodically passing on copies to the media, Senate officials told The Globe. Eh, so how is this different from Watergate again? Why does this just pass through the news without anybody getting lined up to go to jail? Scientists say that they have shown how the brain can crack complex mental puzzles while its owner is sleeping. Research at Luebeck university, in Germany, says tests on 106 volunteers back up anecdotal evidence that a good night's sleep can help solve problems. The volunteers were shown a number puzzle in which was embedded a "hidden code" revealing the answer, the journal Nature reports. Those kept awake overnight reportedly had far less chance of solving it. The scientists believe that because the brain appears to restructure information from the previous day during sleep hours, a period of sleep may produce insight into problems such as these. Other experts say it is the first hard evidence that creativity and problem-solving may be assisted by the activity of the brain during sleep. Dr Jan Born, who led the study, said: "This restructuring might be occurring in such a way that the problem is easier to solve." He highlighted a period of sleep called slow-wave sleep - a deep sleep not thought to be punctuated by dreams. Even small reductions in this sleep phase have been linked by other studies to a decrease in memory function, and in decreasing ability to recognise "hidden structures". Their 106 volunteers were all given a quick look at a test that involved sorting numbers based on a couple of set rules. However, underlying these rules was a third, "hidden" rule which, when spotted, dramatically simplified the completion of the puzzle. Some of the volunteers then got a full eight hours' sleep, while others had various degrees of sleep deprivation. The scientists then sat back to see which volunteers had a flash of inspiration and spotted the third rule and how quickly they managed it. Twice as many of the rested participants caught on to the rule than volunteers from the sleepless group. Shouldn't be too big a surprise, but I guess it is good to have "hard evidence".